Last Monday I introduced you to Darn Good Yarn and the wonderful ways they are making the world a better place through their company. At the end of the post I mentioned that I purchased two skeins. 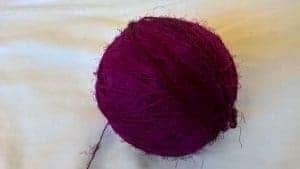 Today I’m going to share with you what it was like to knit with Darn Good Yarn’s Gumball Handspun Sport Weight Recycled Silk yarn in Magenta. The first thing you should know about both yarns I purchased (and, I’m sure, all the yarns purchased from Darn Good Yarn) is that they are put up into hanks. So before I attempted swatching with both yarns, I had to untie the hanks, untwist them, and wind them into balls. After I untwisted the hanks, I slipped each end over the top of one side of a kitchen chair. (I own neither a swift nor a yarn winder.) I’ve found it’s best to do this with two kitchen chairs, set far enough away from each other so that the yarn is stretched out at a reasonable tension. Either too tight or too loose could result in nasty tangles. Gumball Recycled Silk yarn has an interesting texture. According to my research, Gumball’s texture and thickness is typical of recycled silk. Both texture and thickness varied considerably within the skein. Some of it was somewhat thick and fuzzy; other parts were so thin they looked like they belonged on spools of thread. Most of the yarn falls in between these two extremes. It has a significant halo to it as well; it’s very fuzzy. It also had a slight tendency to stick to itself, so at times winding it was a little bit of a challenge. But all told, it didn’t take me very long to wind it, and the tangling issues were minimal to nonexistent. While I was winding the yarn but before I began knitting a swatch, both of my daughters (now aged 16 and 10) told me they wanted something knit from it! The yarn’s beautiful color enthralled them both. Neither seemed to care what I actually knit for them with it; they just desperately wanted the yarn in their possession somehow. I share this anecdote just to drive home the beauty of the color. After I knitted my swatch, I decided to knit each of my daughters an ear-warming headband with the yarn. I chose this because I was pretty sure I had enough yarn to make a headband for each; if I were to make cowls or hats, I’m not entirely sure I’d have enough. 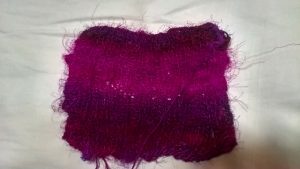 So knowing that I’d be making headbands, I didn’t knit my typical stockinette stitch swatch. Instead I knitted a ribbed swatch (save 3 border stitches on each edge) so that I’d have an idea of how well the yarn held its shape. I have never knitted with 100% silk before, and I had this idea that silk would be tough and unyielding. I’m here to tell you that it’s not at all! Now I’m not going to tell you that recycled silk yarn is as smooshy and soft as merino wool. It’s not. But it’s not tough or scratchy, either. I’d say it has a pleasantly soft nubbiness to it. It’s fun to watch all the different thicknesses unfold as you knit. It’s also fun to watch the different color variations unfurl. Recycled silk yarn isn’t as stretchy as wool, but it’s definitely nowhere near as unyielding as cotton. I found that the yarn took ribbing rather nicely. It certainly didn’t flop about when I finished it. Once I finished the swatch, I washed it in cold water and lay it over a quilt rack to dry. I didn’t really “block” it in any strict sense; I just wanted to get an idea of what it would be like after washing and drying. Would it stiffen up? Would the stitches bloom? Neither of these happened; in fact, the swatch looked and felt about the same before the washing as it did after. One thing I will warn you is that if you do wash your Gumball knitted creation, there’s an excellent possibility that the dye will run. The amount of pink water I saw in my sink surprised me. No harm done — it didn’t diminish the color of the finished swatch at all — just something to keep in mind. The real surprise came when the swatch had finished drying and I unraveled it. I was a bit nervous about unraveling it, because of all those super-thin parts that I was sure would snap like a twig under the slightest provocation. Nope! Not at all! I did have to pull out a few tiny fibers here and there that were causing two adjacent bits of yarn to cling together for dear life, but not a single time did any of the yarn actually snap or break. This yarn is VERY difficult to tink (i.e., un-knit, one stitch at a time). Actual unraveling is relatively easy, but trying to tink it is pretty awful. So you’ll want to make sure you have very good light and can concentrate on what you’re doing, because trust me, you don’t want to have to tink more than necessary! Because of the texture of this yarn, I would highly recommend that you not use it to knit interesting textured patterns. Don’t bother with cables or seed stitch or any kind of patterned stitch. 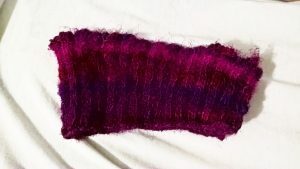 I would almost not even recommend ribbing, except that it’s hard to knit a headband without it and the ribbing does still serve a purpose and look good. But any other kind of textured stitches will disappear completely in this yarn. So if you’re knitting in the round, I’d stick with stockinette stitch (or ribbing); if you’re knitting flat, you’ll probably want to use garter stitch. Here’s the pattern I used for the ear-warming headband. This is a very simple pattern; it uses short rows and ribbing to create a stretchy headband that’s wider in the back (to cover the ears) and narrower in the front. I was a little concerned that the headband might be too loose. But both my daughters tried it on, and it fit both heads! Check it out below. I’m quite pleased with how it turned out. If you’ve never tried knitting with recycled silk yarn before, I definitely recommend this yarn. I enjoyed knitting with it (even though I did hold my breath a few times when I got to the really thin parts) and its strength impressed me. Even though it can stick together, even though it has variations in thickness, even though it has a lot of “fuzz”… I didn’t once encounter a broken strand in the knitted fabric. I still have enough yarn left to make a second headband, so they’ll each have one of their own. But I’m using my Yak Wool first! Stay tuned for the final post in this series, when I’ll describe the experience of knitting with Yak Wool. 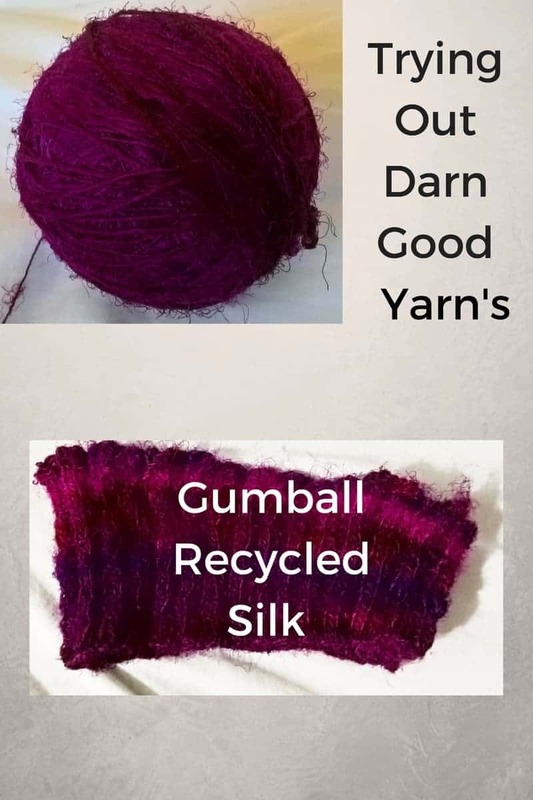 In the meantime, if you’re interested in trying the Gumball Recycled Silk yarn for yourself, you can check it out here! out of their place weight yarn. It is not fuzzy, but extremely soft and warm! I’d love to try fingerless gloves with some of their silk yarn. I can imagine how delightful they would be to wear! Placing the skein on both wrists and then winding? Somehow I can’t quite visualize this… but my chair routine works pretty well! I love the colors of recycled silk yarn! You are right about patterns being lost, but you might like to try a drop stitch pattern. It uses a bit less yarn and looks great with this yarn. Ooh, good call on a drop stitch pattern. I think you’re right, that would probably look really nice with this yarn. I think I might try making a drop stitch cowl, I’ve got more yarn left after knitting the headbands than I thought I would, that might be just the ticket. Thanks for the suggestion!